The Angora rabbit is a variety of domestic rabbit bred for its long, soft wool. The Angora is one of the oldest types of domestic rabbit, originating in Ankara (historically known as Angora),Turkey. Being popular pets with French royalty in the mid 18th century. The breed soon spread to other parts of Europe, arriving in the United States in the early 20th century. There are many individual breeds of Angora rabbits, English, French, Giant, and Satin, are the most popular Other breeds include German, Chinese, Swiss, and Finnish. English, weight 2.0–3.5 kg (4.4–7.7 lb). They are gentle in nature, Their wool is very thick and needs to be groomed daily to keep them tangle free. Keeping the texture of the fur silky means less maintenance. The English is the smallest Angora rabbit of the four breeds. This breed is more common as a pet because of the facial features that give it a puppy dog or teddy bear look. Some English Angoras have been bred to have broken colors (white with black spots) avoid these if you intend showing your rabbit in competitions, as they are not recognized. The English breed is the only rabbit to have fur covering its eyes. Angoras are bred mainly for their soft silky wool. Their comical appearance and calm and docile nature make them popular pets. 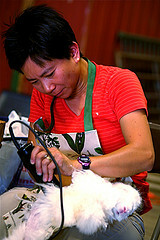 Grooming is necessary to prevent their fur from matting and felting. 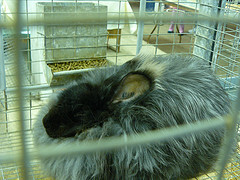 A condition, wool block, is common in Angoras, similar to hair balls in cats where the fur is ingested, a close eye should be kept on all Angora breeds. In addition to daily grooming, it is necessary to shear every three to four months throughout the year, for this reason Angora rabbits should only be kept by dedicated owners. Weight:3.5–4.5 kg (7.7–9.9 lb).ARBA accepted varieties: pointed white, self, shaded, ticked, wide band, also it can be brown tones, and brokenThis breed has a preponderance of guard hair on the surface, with wool as an undercoat. If the texture is correct, it is the lowest maintenance Angora breed. The French Angora is one of the large Angora breeds at 7.5 to 10lbs, with a commercial body type. Possessing a clean face and front feet, with only minor tufting on the rear legs the French differs from other Angora breeds. The color of a French Angora is determined by the color of its head, feet and tail , they must be all the same color. The silky fur used in the manufacture of sweaters, mittens, baby clothes and millinery. GermanWeight: 2.0–5.5 kg (4.4–12 lb).IAGARB accepted varieties: all (not subject to ARBA standards)This breed is common in the United States and Canada. 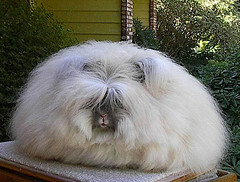 It is very similar in appearance to the Giant Angora. The majority of German Angora are ruby-eyed white or albino. Bred mainly for the quality of their fur, they have been cross bred to achieve better spinning texture and many colored and black German rabbits exist..
ARBA accepted varieties: ruby-eyed-white created by Louise Walsh, of Taunton, Massachusetts. The Giant Angora is the largest of the ARBA accepted breeds, specially bred for the quality of its wool like fur. Its coat contains three types of wool: soft under wool, awn fluff, and awn hair; the awn type wool exists only on the Giant and German Varieties. This breed should have furnishings on the face and ears. The Fur can be sheared every 90 days when up to 12 ounces or more can be gathered. As the fur may be ingested as a natural occurrence a supplement of papaya (from the vitamin section of the grocery store) in their diet helps wool to breakdown in their digestive tract This plus a regular diet of hay will help the movement of the wool through the rabbits system.